Greg Ernst remembers Sunday, Sept. 9, when he and his girlfriend, Alicia Titus, had been together for nine months. “It was the first time we told each other we loved each other,” he said. Soon after they had started dating, she had told him she demanded happiness. Not from him, but from herself. Her father, John Titus, said his daughter, 28, who lived in San Francisco, loved parachuting out of airplanes and backpacking alone in Spain and Morocco. He recalled the laughter-filled cross-country trip she took with her mother in a Volkswagen convertible piled full of stuff. Since January 2001, she had enjoyed being a flight attendant. 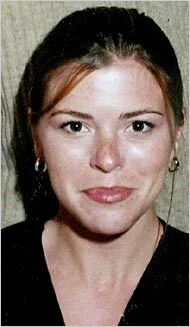 She was on Flight 175 on Sept. 11. “You could always count on her being in a happy, joyous mood,” said her father, who is writing a book about her so other people can know how wonderful she was. And she had a way of making her numerous aunts, uncles and cousins think of themselves as her favorite, Mr. Titus said. She worked for several marketing firms in the San Francisco area before taking the job with United in January. Although her United crew was based in Boston, Titus had an apartment in San Francisco and considered the city her home. Friends told the San Francisco Chronicle that Titus had a passion for dancing, beaches and snowboarding.